Ecuador is located on the west by the Pacific Ocean, and has 2,237 km of coastline. It has 2237 km of land boundaries, with Colombia in the north (708 km border) and Peru in the east and south (1,529 km border). all thisis stuopid , 276,841 km2 (106,889 sq mi) is land and 6,720 km2 (2,595 sq mi) water. Ecuador is one of the smaller countries in South America, slightly smaller than the U.S. state of Nevada. The capital and second most-populous city is Quito, with a population of 1.4 million. The most-populous city is Guayaquil (2 million). Other important cities include Cuenca (0.41 million), Ambato (0.28 million), Portoviejo (0.23 million), Machala (0.21 million), and Loja (0.14 million). Ecuador is divided into three continental regions—the Costa (coast), Sierra (mountains), and Oriente (east)—and one insular region, the Galápagos Islands (officially Archipiélago de Colón). The continental regions extend the length of the country from north to south and are separated by the Andes Mountains. The Galápagos are located 1,000 km west of the Ecuadorian coast. They are noted for their association with Charles Darwin, whose observation of animals here during the voyage of the Beagle led to his formation of the theory of natural selection as a means of evolution. The islands have witnessed a large number of tourists and travellers over recent years. As a result, various hotels and restaurants are now flourishing in the area offering tour packages and cruise services. Special species that could be found here include blue footed boobies, iguanas and many more. Internal flight services from Ecuador to Galapagos are also available for tourists making it more convenient for guests from outside. The western coastal area of Ecuador borders the Pacific Ocean to the west, encompasses a broad coastal plain, and then rises to the foothills of the Andes Mountains to the east. It is estimated that 98% of the native forest of coastal Ecuador has been eliminated in favor of cattle ranching and other agricultural production, including banana, cacao and coffee plantations. The forest fragments that still survive are primarily found along the coastal mountain ranges of Mache-Chindul, Jama-Coaque, and Chongon-Colonche, and include tropical dry forest, tropical wet forest, tropical moist evergreen forest, premontane cloud forest, and mangrove forest. Collectively known as the Pacific Equatorial Forest, these forest remnants are considered the most endangered tropical forest in the world, and are part of the Tumbes-Choco-Magdalena biodiversity hotspot. Guayaquil, located on the southern part of the coast is the biggest city in the country. On the north coast of Ecuador the port of Balao in Esmeraldas is used for oil export and the port of Manta was formerly used by the United States Air Force as a control point for narcotics traffic control until 2009. The central belt of Ecuador that includes the Andes Mountains, inland from the coast; with volcanoes and mountain peaks that sport year-round snow on the equator; many areas long since deforested by agriculture; a number of cut-flower growing operations; at a certain altitude zone may be found cloud forests. The northern Ecuadorian Andes are divided into three parallel cordilleras which run in what is similar to an S-shape from north to south: the western, central (Cordillerra Real) and eastern (Cordillera Occidental) cordilleras. The cordilleras were formed earlier in the Cenozoic era (the current geological era), as the Nazca Plate has subducted underneath the South American Plate and has raised the mountain range. In the south, the cordilleras are not well defined. Quito, the capital city, is located in a high mountain valley on the foothills of the Pichincha. The town of Baños features hot springs swimming pools on the foothills of the Tungurahua in the Central Cordillera. The road from Baños to Puyo has long been known for its narrowness, curves and sheer drops (only one lane in some places, on one area, actually cut into the side of a cliff so that the cliff roofs over it). The most important east-west road across the Andes is the road from Quito to Lago Agrio, which is paved for most of its length yet is heavily traveled by tractor-trailers—and the Trans-Ecuadorian Oil Pipeline serves as the guardrail for long stretches of this road. Cotopaxi (5,897 m) is the tallest active volcano in the world. Much of the Oriente is tropical moist broadleaf forest (Spanish: la selva), on the east slopes of the Andes Mountains and descending into the Amazon Basin, with strikingly different upland rainforest with steep, rugged ridges and cascading streams (can be seen around Puyo) and lowland rainforest. The oil fields are located in the Amazon basin, headquartered at Lago Agrio; some of the rainforest has been seriously damaged in this region and environmental degradation is severe, with catastrophic oil pollution in some areas. Some 38% of Ecuador's land is forested, and despite a 1.5% annual deforestation rate remains one of the most biodiverse locations on the planet. The Oriente is also home to a large number of Ecuador's indigenous groups, notably the lowland Quechua, Siona, Secoya, Huaorani, and Cofán. Imbabura Volcano photographed in black and white. 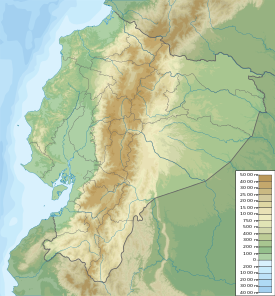 The second major Costa river system—the Esmeraldas—rises in the Hoya de Quito in the Sierra as the Guayllabamba River and flows westward to empty into the Pacific Ocean near the city of Esmeraldas. The Esmeraldas River is 320 kilometers long and has a 20,000-square-kilometer drainage basin. Each region has different factors that affect its climate. 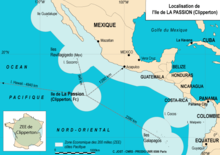 The Costa is influenced primarily by proximity to warm or cool ocean currents. By contrast, climate in the Sierra varies more as a function of altitude. The Oriente has a fairly uniform climate that varies only slightly between the two subregions. Climate in the Galápagos Islands is both moderated by the ocean currents and affected by altitude. Throughout Ecuador variation in rainfall primarily determines seasons. Temperature is determined by altitude. With each ascent of 200 meters (656 ft) in altitude, temperature drops 1 °C (1.8 °F). This phenomenon is particularly significant in the Sierra. Temperatures in the Sierra do not vary greatly on a seasonal basis; the hottest month averages 16 °C (60.8 °F) and the coolest month, 13 °C (55.4 °F) in the upper elevations. Diurnal temperatures, however, vary dramatically, from cold mornings to hot afternoons. The almost vertical sun and the rarefied air in the higher Sierra region allow the land to warm quickly during the day and lose heat quickly at night. Mornings typically are bright and sunny, whereas afternoons often are cloudy and rainy. In general, rainfall amounts are highest on exposed locations at lower altitudes. Rain can also vary on a local basis. 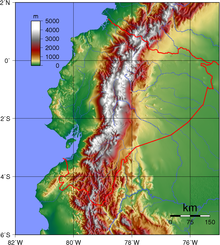 Sheltered valleys normally receive 500 millimeters (19.7 in) per year, whereas annual rainfall is 1,500 millimeters (59.1 in) in Quito and can reach 2,500 millimeters (98.4 in) on exposed slopes that catch rain-bearing winds. On a seasonal basis, the driest months are June through September. The climate in the Sierra is divided into levels based on altitude. The tropical level—400 to 1,800 meters (1,312 to 5,906 ft)—has temperatures ranging from 20 to 25 °C (68.0 to 77.0 °F) and heavy precipitation. The subtropical level—1,800 to 2,500 meters (5,906 to 8,202 ft)—has temperatures from 15 to 20 °C (59 to 68 °F) and moderate precipitation. The temperate level—≤2,500 to 3,200 meters (8,202 to 10,499 ft)≥- -has a year-round temperature in the range of 10 to 15 °C (50 to 59 °F) and an annual rainfall of 1,000 millimeters (39.4 in). The temperate level experiences rainstorms, hailstorms, and fog. Winter, or the rainy season, lasts from January through June, and the dry season or summer from July through December. Most rain falls in April. There also is a short rainy period in early October caused by moisture penetrating the Sierra from the Oriente. Quito and most other populated areas in the Sierra are located at this temperate level. The cold level extends from the temperate zone to 4,650 meters (15,256 ft). Here, average temperatures are 3 to 9 °C (37.4 to 48.2 °F), and the precipitation often appears in the form of rain, hail, and thick fog. Above 4,650 meters (15,256 ft) is the frozen level, where peaks are constantly capped with snow and ice, and temperatures range from below 0 to 3 °C (32.0 to 37.4 °F). Precipitation frequently is in the form of snow, fog, and rain. The Eastern lowlands in the Oriente experience abundant rainfall, especially in the Andean piedmont, sometimes exceeding 5,000 millimeters (196.9 in) per year. Temperatures average 25 °C (77 °F) in the western parts of this region. The jungle-covered plains of the Eastern lowlands register high levels of rainfall and temperatures surpassing 28 °C (82.4 °F). Being located on the equator, the Galápagos Islands would have an equatorial climate were it not for the modifying effects of the Peruvian Current. Instead, climate on the islands follows a pattern more like that of the Sierra than the Costa. At sea level, the land is desertlike with temperatures of 21 °C (69.8 °F). The eight summer months experience no precipitation, whereas the winter months of January through April have some fog and drizzle. Above sea level to an altitude of 450 meters (1,476 ft), the islands have a mixture of tropical, subtropical, and temperate climates. In general, temperatures are around 17 °C (62.6 °F). There is constant fog and drizzle in the summer and rain in the winter. The cold level above 450 meters (1,476 ft) has temperatures below 14 °C (57.2 °F). It is cool along the tropical coast. Ecuador has land which is rich in petroleum. Main fishing products include herring and mackerel. Other natural resources include timber and hydropower. Natural hazards in Ecuador include frequent earthquakes, landslides, volcanic activity; periodic droughts and floods. deforestation; soil erosion; desertification; water pollution; pollution from oil production wastes in ecologically sensitive areas of the Amazon Basin and Galapagos Islands. ^ "Biodiversity Hotspots". Tumbes-Choco-Magdalena. Archived from the original on 9 August 2011. Retrieved 13 November 2011. ^ "Ecuador Forest Information and Data". Rainforests.mongabay.com. Retrieved 8 November 2012. "A Country Study: Ecuador". Library of Congress Country Studies. Washington, DC: Library of Congress. 1989. This page was last edited on 18 April 2019, at 10:09 (UTC).